How did you choose your electric tariff? Based on the advice of friends and neighbours in Spain? If some time has passed since you last checked your bills, follow our simple guide and starting saving money right now. Power capacity: The rate you have contracted in kW x days x price. Electricity tax: A special tax (similar to alcohol or tobacco taxes) applied on both the power capacity and consumption. Both fixed and variable costs are subject to VAT at the current rate. 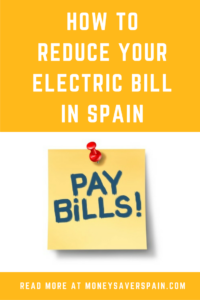 Remember that most electric companies in Spain offer billing in different languages, so it’s easy to check what you’re paying. The higher the power capacity rate on your bill, the more you’ll pay every month. Companies tend to put customers on higher kW rates than required, as most people won’t bother checking it. * Note: two figures are shown for each rate corresponding to the old and new system. Additional levels exist between those shown. Use the Capacity Calculator on Endesa’s website (available in English, no need to be a client) to receive a suggestion for the power capacity you should contract. Don’t rush out and drop your rate thinking you’ll save immediately – the use of your electrical appliances will be limited by the trip switch. If you’ve never had any problems with your trip switch on days with the heaviest electric use (air con, washing machine, etc) then you’re probably paying too much and can safely drop down a level. When you reduce your power capacity there is a charge of approx. 11€, but if you find you really need more power then you’ll be charged 45€ to increase it. When over 20 years have passed since the previous certificate was issued. The increase exceeds the level shown on the current certificate. It’s a change for a new property not previously occupied. All changes in the Canary Islands. Check with your provider to see what charges they will levy and factor them in before deciding whether to make a change. Saving: 30-60€ per year (for each level reduced, after charges). When you have a good understanding of your bill and have tackled the fixed part, then you can move on to the variable part. Electricity tariffs are a nightmare, with well over 100 available. Added to this are the peculiarities of different consumers. If you’re extremely organised then a tariff based on specific days (eg weekends) may suit you, but these cases are the exception rather than the rule. Use our online comparison service available in English with our partner Watiofy. No obligation to sign up to anything, just input your details for a detailed report showing all your options. And if you’re already on the best tariff for your circumstances, well done! Results are shown for the full price you’d pay in the first year and the second year (as many companies have 12-month introductory offers). Changing tariffs is easy and free, you’ll need to locate your Unified Supply Point Code CUPS number on your bill – an alphanumeric code starting with ES – to quote when speaking with the company. Don’t forget that there are lots of new companies on the market with decent tariffs, you don’t need to go with one of the well-known names. Even if a smaller company stops trading, your electricity will never be cut off. Why? Smaller companies do not generate power, they simply buy and sell it on the free market. One of the bigger companies always has overall responsibility for the supply and this is shown on the invoice. Maintenance Service Contracts – Are They Worthwhile? Well, it depends. Do you have a separate boiler contract? If so, then you may find that you’re duplicating payment. Remember, lots of special tariffs have a mandatory maintenance contract. If your home is quite new, you may be paying for nothing. For older homes if may be worthwhile. Saving: Around 10€ per month. Regulate your air con/heating! The recommended temperature for your home is 18 to 21ºC. Reducing the setting by a couple of degrees means more savings. If you have a maintenance contract and change provider, the maintenance contract will NOT be cancelled by your current supplier. The maintenance contract is included on your normal bills “for your convenience”, but it’s also a sneaky way to make sure you carry on paying as many people won’t notice a monthly payment of around 10€. If you decide to cancel your maintenance contract, you must specifically inform the company. Don’t listen to anyone visiting your home to “check your bill”. They will NEVER offer you the best tariff as they work commission-only. Previously this was a way to get people’s personal data to change contracts without their knowledge, however all contracts must now be signed to avoid fraud or agreed by telephone. Stop giving away money to electric companies! Put aside an hour this week to check your electric bills, it could be the best hour you invest this month.